Put safety first with this Lavex Janitorial 25" caution wet floor sign! Featuring a bright yellow, plastic construction, this sign is lightweight in design, yet highly visible. Its a-frame style offers quick and easy setup wherever floors are wet, and when not in use, it collapses for out-of-the-way storage. A handle at the top of the sign makes it easy to carry the sign by hand or on your janitor cart for added convenience. Great sign! Bright yellow. Very easy to use. The material is study and is exactly what I am looking for. Will order a couple more as back up. This wet floor sign does exactly what it is supposed to. It stays put and informs people that the floor is wet. It easily folds for storage. man o man! what can i say about this sign? its incredible. it works as advertised and it stores very well when not in use! Love these wet floor signs that come out every time we mop or customers track rain into the front entrance. Large size plus bilingual translation make these a winner. Great wet floor signs. I really like how they say wet floors in Spanish as well. They are a little light duty but for the price, you can't bet it. Little cheapy made but it does the job. Like how the fold flat for storage which is a + for us. The size and lettering is good. A must have when mopping floors where people are present. Lightweight and easy to stand up. The bright yellow color is highly visible to help prevent slips and falls. Safety first! Love the fact that it has both Spanish and English on it. It’s not made of really heavy plastic so it does bow a bit toward the bottom. Nevertheless a good product at a great price. For wet floor safety these signs are a great value, being made of a light weight plastic they aren't as durable as the big name manufacturers, but you are paying much less for in my opinion a safety sign that with a little diligent care will serve the same purpose. Sign stands up fine and does the job. Easy to read and folds flat for easy storage. We keep two of them on hand to make sure wet floor is always observed. The product itself is really light, but, the price is really cheap. so, if you are in a budget, i would recommend go for this one. Made of durable plastic, this sign is still lightweight enough to maneuver from place to place as needed. “Caution yellow” color commands attention to wet floor. Very functional, easy to store, perfect size. I love that it’s in BOTH English and Spanish, it’s really important since I have Spanish speaking customers as well. A wet floor sign is valuable and vital to any business to avoid liability/law suits etc. It stands by itself and it’s sturdy enough. It’s standard size so you can’t miss the sign. Most importantly it’s the cheapest I could find. This Caution Wet Floor sign is very flimsy and on the cheap side. But it serves its purpose and that is to warn guests/employees of a wet floor, to prevent injury! Really good product and light material. Easy to carry around. Small but bright enough for easy to Spot. I would like to give 5 starts and recommend it to other people. Great product, especially for the price. They fold up tightly and open to the appropriate stance without spreading too far. There is no reason to spend more money for another brand that does the same thing. Good Wet Floor Signs. They get the job done and it alerts your customers of a floor hazard (wet floor). Careful when opening you might get your finger stuck but other than that it's a good product. Reasonably priced and they do the job! I like that they fold up and can easily be kept out of the way without taking up too much space. these are a very economical solution to protecting your self from a law suit if you have customers walking in wet areas. The 2 I ordered seem to be holding up well after a couple months of use, highly recommend them! Obviously in A Food establishment, these are needed item, but I was so happy to see how big they were when they arrive to given how reasonable the pricing wise. I’m sure that I’ll end up needing more than three, but these were a great start in a really wonderful value . Very nice, clear on letter, easy to read .i like it a lot. Very responsible on price. I will definitely recommend to all people I know. These signs serve the purpose of warning people of a wet floor. They are not tremendously heavy duty, but they are very light weight and fold up to store easily. Can't beat the bang for your buck on this product. Way cheaper than similar options, and gets the job done. Construction is solid, not flimsy or cheap feeling. The bilingual aspect is great too. Light weight enough that it's perfectly comfortable to pick up, move around, but not so light it'll fall over with a slight breeze or someone brushing it as they walk by. Folds up nicely so as not to take up unnecessary space when not in use. This wet floor sign is not of the best quality but it’s not bad either. Compared to paying more from other suppliers this sign is perfect. It does what I need it to do such as letting people know that the floor is wet. I will be buying more soon. Made out of very sturdy material. We had other wet floor signs that used to break easily, so far this one lasted the longest out of all of them. I’d highly recommend these. This product is as described. It does clearly stand out and can be set up easily. The plastic is a little flimsy so that was the opportunity. No need to buy a more expensive sign, this one will do fine. Locally a sign like this was more money. It's not heavy duty but it's just a sign. We have two of these signs, they are a sturdy wet floor sign that doesn't fall when spread open. It is a nice addition to have the Spanish writing included on the sign. Great for the cost. A little smaller than I anticipated, but it still gets the job done. I just needed something simple and this is perfect! The price is low but the sign does its job, bright and big enough for the customers caution. It’s also light and easy to fold in and out. Definitely the lowest price that I found on the internet for a yellow wet floor sign. Pretty much standard in terms of quality compared to other brands, not the prettiest but gets the job done. Great little sign for the price. The sign feels just a little on the cheap side, but I'm still giving it five stars because of it's value. It's worth it. Great sign! Made of sturdy material and easy to use. Bright colors and clear wording make it easy to read/see. A must have for any wet floor! Great sign with both English and Spanish writing! Very durable plastic and can easily open and close for fast clean up! Would highly recommend for any restaurant! Not much to say about it. 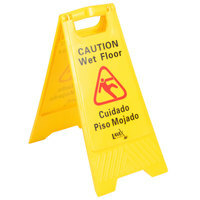 This caution wet floor sign it's bright enough to capture the attention of your costumers, light and easy to carry. We purchased a bunch of these signs, and I honestly was expecting a bit more... They do meet the requirements for safety, but the plastic on them is thin, I don't expect them to last that long..
Got this for the children’s bathroom in church. Some kids saw this and told their mother “Don’t go there, the floor is wet”.Read the sign. Great, light weight wet floor sign. It does feel a little flimsy but it works well for everyday general use. Light enough to hang on the wall is a plus! This is a Basic wet floor sign. I can not really say anything bad about it. It is exactly as pictured and exactly as described. Bright yellow sign, easy to see and use. This helps maintain a safe work environment in your place of work. They are perfect for public use or in-house use. The lettering on the signs are big and easy to see from any distance. Good price and good product. It gets the job done and notifies customers of a wet floor without breaking the bank! Use it everyday and still looks new after years of use. Easy to clean. Easy and small for quickly needed access, we use these all around for wet floors and to call attention to our customers, always good to have extra and for such a cheap price you should stock up! This yellow Lavex Janitorial 25" Caution Wet Floor Sign is light weight, easy to open and close, and it also is easy to clean. When used with the Lavex Janitorial Red Mop Bucket it will provide additional warning to your customers. The wet floor signs are perfect for the price! They are not the sturdiest signs, but definitely get the job done! Exactly as pictured and delivery was fast. If I need more in the future, I will purchase these again! The perfect sign for our small diner. The sign comes preassembled which saves us time and it is ready to use out of the box. A great quality and very easy to store. I love that this sign already comes assembled. It also collapses and folds flat for out-of-the-way storage since we don’t have a lot of storage space . Perfect for this time of year with all the snow and foot traffic coming in. The Lavex Janitorial 25" Caution Wet Floor Sign is a good, economical approach to alert guests of slippery surfaces. It is easy to set up near or on spills, and can be stowed away flat to save space when not in use. Don't ever buy a different wet floor sign. This sign is perfect. It is well made and sturdy. It beats all of the expensive wet floor signs on the market. Very durable and well made. We love this economical wet floor sign! It folds up nice and thin, making it easy to store. It's made of pretty heavy duty plastic, so it's also easy to wipe down. The bright yellow color stands out and makes sure no one misses it! I loved my wet sign! The collors are bright and the size of the sign is like any other! The price is reasonable compared to other stores? This wet floor sign is perfect for my business requirements. It's easy to use and very inexpensive. It seems like it will hold up well. Always need one of these around. Perfect size, easy to store out of the way, durable and good quality. Delivery of item in good shape. Very good wet floor sign! Sturdy and easy to read! Perfect for high traffic areas like our donut shop! I recommend this to all owners!